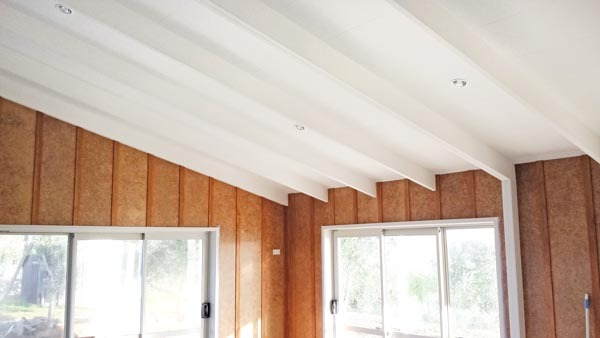 Triboard TGV – manufactured by Juken New Zealand Ltd [JNL] is an innovative engineered wood panel that offers an alternative to plasterboard. Triboard TGV – tongue and groove panels, have been developed specifically for high impact resistance. The three key benefits are speed of installation, ability to be joined off frame and the fact they are paint ready. Manageable sized sheets mean they can be easily installed by one person, reducing construction time and cost. There’s nothing better than having positive fixing in the garage or rumpus room. To be able to fix a shelf or dryer directly onto the walls without fixing to studs is hugely beneficial. Unlike plasterboard wall linings, which generally require a tradesperson to prepare the surface for paint, Triboard TGV is ready to paint, eliminating those preparation costs.